The global polycaprolactone market consists of a few global and local players. The market is considerably fragmented, says Transparency Market Research (TMR) in a report. The global polycaprolactone market share is evenly categorized among a few major companies. There are some noteworthy players heading the global polycaprolactone market to deliver quality products to end-users. The most important enterprises operating in the global polycaprolactone market are Polymtek Biomaterial, Shenzen Esun, Polysciences, Inc., Durect Corporation and Haihang Industries Co., Ltd.
As said in the report of TMR, the global polycaprolactone market was valued at US$ 40 mn in 2016. It is projected to achieve US$ 30 mn by 2026 by stretching out at a CAGR of 9.5% for the duration of 2017 to 2026. On the basis of form, the global polycaprolactone market is projected to lead through the pellets form and will further be trailed by the nano sphere form. The nano sphere type category is projected to grow at noteworthy CAGR in the coming years. This is due to the utilization of nano sphere polycaprolactone in the healthcare sector. The other category is projected to develop at a steady rate in the forthcoming years with regular inflow of need for several applications. Geographically, Europe and North America are expected to lead the global polycaprolactone market in the upcoming years. Together, these two economies will entertain maximum market share. Of the numerous economies in Asia Pacific, India is projected to witness highest growth. Also, China has the maximum market share in terms of both consumption and production. 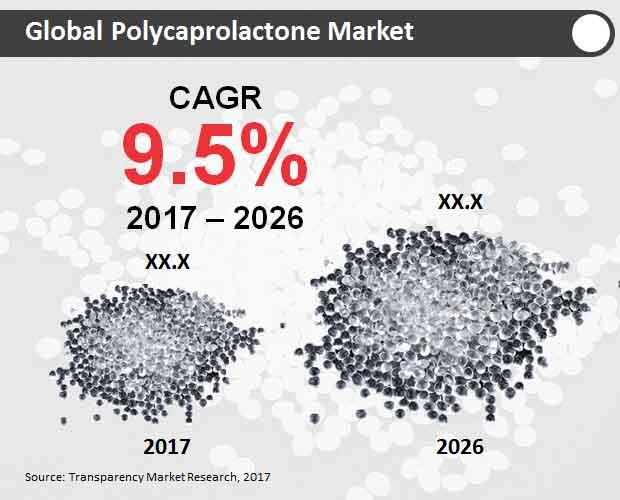 Also, MEA and Latin America are estimated to remain high growth and low volume economies in the global polycaprolactone market in the forthcoming years. Development of the polycaprolactone market is primarily due to numerous micro-economic and macro-economic aspect. Rising need for manufacture of thermoplastic polyurethane (TPU) has gunned up demand for the global polycaprolactone market. As TPU is progressively utilized in range of enterprises like construction and packaging, healthcare, and automotive. Insulation to high elasticity and high abrasion is expected to boost sales of the polycaprolactone among TPU producers substantially. Furthermore, polycaprolactone has high resistance degree to oil and grease, owing to which this polymer is extremely considered over any other biodegradable polymers like polyhydroxyalkanoates and polylactide. Usage of polycaprolactone in range of medical gadgets like drug delivery system has continued to pose strong challenges like slow in speed of degradation and low load bearing features. Additionally, approval by the FDA to use polycaprolactone applications like sutures and drug delivery will endure to affect the growth of the market. Need for polyurethane endures to remain at top in the healthcare sector. This is due to rising demand for wound dressing, surgical drapes general purpose tubing, hospital bedding, and injection-molded devices. Need for polycaprolactone is further due to rising demand to encapsulate and seal the microelectronic components that are sensitive to pressure. With the rising demand for proofing against high temperature in electronic element, producers are majorly choosing for polyurethane that is manufactured with the polycaprolactone polymer. Abrasion and tear proof are projected to drive the demand to include the rigid polyurethane foams as an insulator. Rising need to insulate the boats from extreme temperature and noise will boost the polycaprolactone market.